The regional policy of the European Union (EU), also referred as Cohesion Policy, is a policy with the stated aim of improving the economic well-being of regions in the EU and also to avoid regional disparities. More than one third of the EU's budget is devoted to this policy, which aims to remove economic, social and territorial disparities across the EU, restructure declining industrial areas and diversify rural areas which have declining agriculture. In doing so, EU regional policy is geared towards making regions more competitive, fostering economic growth and creating new jobs. The policy also has a role to play in wider challenges for the future, including climate change, energy supply and globalisation. The EU's regional policy covers all European regions, although regions across the EU fall in different categories (so-called objectives), depending mostly on their economic situation. In the current 2014–2020 funding period, money is allocated differently between regions that are deemed to be "more developed" (with GDP per capita over 90% of the EU average), "transition" (between 75% and 90%), and "less developed" (less than 75%), and additional funds are set aside for member states with GNI per capita under 90 percent of the EU average in the Cohesion Fund. 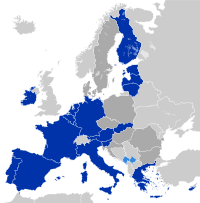 Between 2007 and 2013, EU regional policy consisted of three objectives: Convergence, Regional competitiveness and employment, and European territorial cooperation; the previous three objectives (from 2000–2006) were simply known as Objectives 1, 2 and 3. Territorial cohesion is a European Union concept which builds on the European Spatial Development Perspective (ESDP). The main idea of territorial cohesion is to contribute to European sustainable development and competitiveness. It is intended to strengthen the European regions, promote territorial integration and produce coherence of European Union (EU) policies so as to contribute to the sustainable development and global competitiveness of the EU. Sustainable development is defined as development that "meets the needs of the present without compromising the ability of future generations to meet their own needs". The main aim of the territorial cohesion policy is to contribute to a balanced distribution of economic and social resources among the European regions with the priority on the territorial dimension. This means that resources and opportunities should be equally distributed among the regions and their populations. In order to achieve the goal of territorial cohesion, an integrative approach to other EU policies is required. The main resource of EU's territorial cohesion policy is EU's structural funds, considered to be delivered to the most deprived areas of EU. There are two structural funds: the European Regional Development Fund (ERDF) and the European Social Fund (ESF). The ERDF is intended to be used for the creation of infrastructure and productive job-creating investment and it is mainly for the businesses. The ESF is meant to contribute to the integration of the unemployed populations into the work life via training measurements. By far the largest amount of regional policy funding is dedicated to the regions designated as less developed. This covers Europe's poorest regions whose per capita gross domestic product (GDP) is less than 75% of the EU average. This includes nearly all the regions of the new member states, most of Southern Italy, Greece and Portugal, and some parts of the United Kingdom and Spain. With the addition of the newest member countries in 2004 and 2007, the EU average GDP fell. As a result, some regions in the EU's "old" member states, which used to be eligible for funding under the Convergence objective, became above the 75% threshold. These regions received transitional, "phasing out" support during the previous funding period of 2007–13. Regions that used to be covered under the convergence criteria but got above the 75% threshold even within the EU-15 received "phasing-in" support through the Regional competitiveness and employment objective. Funding for less developed regions, like the Convergence objective before it, aims to allow the regions affected to catch up with the EU's more prosperous regions, thereby reducing economic disparity within the European Union. Examples of types of projects funded under this objective include improving basic infrastructure, helping businesses, building or modernising waste and water treatment facilities, and improving access to high-speed Internet connections. Regional policy projects in less developed regions are supported by three European funds: the European Regional Development Fund (ERDF), the European Social Fund (ESF) and the Cohesion Fund. These are regions whose GDP per capita falls between 75 and 90 percent of the EU average. As such, they receive less funding than the less developed regions but more funding than the more developed regions. This covers all European regions that are not covered elsewhere, namely those which have a GDP per capita above 90 percent of the EU average. The main aim of funding for these regions is to create jobs by promoting competitiveness and making the regions concerned more attractive to businesses and investors. Possible projects include developing clean transport, supporting research centres, universities, small businesses and start-ups, providing training, and creating jobs. Funding is managed through either the ERDF or the ESF. This objective aims to reduce the importance of borders within Europe – both between and within countries – by improving regional cooperation. It allows for three different types of cooperation: cross-border, transnational and interregional cooperation. The objective is currently by far the least important in pure financial terms, accounting for only 2.5% of the EU's regional policy budget. It is funded exclusively through the ERDF. ^ "European Spatial Development Perspective". Retrieved on 7 April 2009. ^ "European Spatial Planning Observation Network". Retrieved on 7 April 2009. European Commission Directorate-General for Regional Policy (2008). Working for the regions (pdf). Luxembourg: Office for Official Publications of the European Communities. ISBN 92-79-03776-5. Cat. No. KN-76-06-538-EN-C. Retrieved 28 July 2010. This page was last edited on 15 January 2019, at 04:46 (UTC).